The Middle Stump: England in Good Health? The article quotes Harrison as saying the English game is in "really good shape". He says that whilst the Ashes results were "disappointing, it wasn't time to make knee jerk decisions". Harrison quoted Women's cricket, which I will give him as it has improved but the other aspects such as One Day cricket, the Academy at Loughborough and All Stars are regarded as many as sickly. More on All Stars later. Let's start with the One Day game. Last year we got to the semi final of a competition on home soil. I would suggest that is reflective of where we are in World cricket. We still haven't won a World Cup since its inception in 1975. There is more silverware in the cutlery drawer of Mr Harrison's kitchen than in the trophy cabinet of the ECB. You could also argue that the appointment of Trevor Bayliss with his emphasis on improving One Day cricket has been to the detriment of our Test side. The positioning of deep extra covers in the opening overs of Test cricket is a testimony to this. The Academy is not producing the players that it should. The spin emanating out of the ECB with this statement is far more prolific than the amount of twirlers being produced in the county game. Our record abroad is on a par with Attilla the Hun or Napoleon. As for pace bowling, we are just not producing them. We get bowlers who get near the England side and they lose pace or get injured. We have a production line of right arm over seamers at 83mph which Bayliss loves but where is the express pace - the one that is going to be to quick for the leg side angled bat of Steve Smith and rap him on the pads? A lot of money is going into producing over coached players who have the pace coached out of them, with accuracy usurping sheer speed. As for club cricket, this is my biggest point of ire. The ECB have made the big clubs get bigger and the smaller clubs are losing out. The red tape that clubs have to go through to provide coaches is akin to Brexit negotiations, so therefore the bigger clubs that have the infrastructure will benefit. Financial muscle abounds and the rich get richer whilst the smaller clubs get nothing. David Davis would worry about going through a Level One coaching badge along with the First Aid and theory courses. Harrison is no doubt pointing out the alleged 'success' of the All Stars programme, aimed at 5-8 year olds in the UK. After one summer, it is too early to tell but the cricketing community are split on whether it has been a success. Our club had 15 on the course and we made a fiver per kid. Yes, a grand total of £75! Naturally, clubs are hoping to see the benefit of renewals next season but there was a lot of work put in for not a lot of rewards. The parents pay £40 for little 'Johnny' to have club players babysit their child for two hours a week but a lot of this goes to the ECB. Hmmm. No wonder they are so keen to deem it a success, so early. Talking of money, the big clubs are out muscling the smaller clubs in adult and junior cricket. Premier League clubs are employing Directors of Cricket to go into local schools and to encourage kids to join their clubs. Whilst this is good to get kids playing the game, the fact of the matter is that colts cricket is now a business. If you have 500 juniors paying £60 subs a year (a conservative figure too in London cricket! ), then it doesn't need Archimedes or Pythagoras to tell you that your club is £30,000 in the black before the league season starts. Is this money working its way back to grass roots, or is it ending up in the pockets of 'Directors of Colts Cricket', who just happen to be Grade A Australians, or very good league players who turn out for the first team? Throw in the bar profits of the parents drinking along with cricket camps during half term or/and August at £100 a week per child (where 25 turn up per week) and you can see that junior cricket is now a business. Then there is the sporting development of that child. Most clubs have four year groups - Under 11, Under 13, Under 15 and Under 17. Under 17 is where there is a huge fall out but even so, let's just say for arguments sake that each year group has 125 children. Running even three teams in a county league means that there are 90 odd kids per year group who are just turning up and training, without the joy of competitive cricket against rival clubs. Even the 33 who play in the sides are playing a number of inter club matches. Is this good health? So when I read articles such as the one on ESPN Cricinfo, you have to take it with a pinch of salt. The All Stars programme will not be known if it is a success or not for a number of years. Concentrate instead on making it easier for clubs to provide coaching without the red tape, concentrate on making it easier for clubs to get funding without being Clubmark accredited and having to jump through more hoops than a sea lion in a zoo. Make it easier for all clubs and not just the big ones to provide colts cricket. Concentrate on why the retention levels of 15 and 16 year olds are so poor, concentrate on getting cricket into state schools and finally, get meaningful cricket and not just the gimmick of franchise cricket back on free to air tv, so that kids can identify with the players again and thus want to emulate their heroes. That is how to get the kids playing the game, not by giving away gimmicks of free back packs made in China. If we don't, participation levels will drop further and that is worrying for us all. If this is English cricket in good health, then I'd hate to see it when it is ill. At the moment, grass roots cricket needs surgery. All Stars is a great initiative but Clubs are taking a huge HIT in supporting it. IF it is such a huge success meeting a marketing sweet spot, where is the sponsor to invest in the grass roots game? The FA have LIDL for theirs grass roots. I also contest the health of women's game there is no exclusive strategy the ECB are gambling on girls playing All Stars and the feel good story of the World Cup champions. As for junior money I would suggest most clubs re-invest the subs into junior sections that are expensive to run and maintain through the bureaucracy. 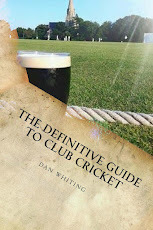 Couldn't agree more with this assessment of Club Cricket in particular. Clubmsrk is a huge burden on volunteers, whilst I completely understand safeguarding is hugely important, a lot of what surrounds it makes grown me weep (and women too). The biggest are getting bigger (& richer), while small clubs gold or merge - how is this success?